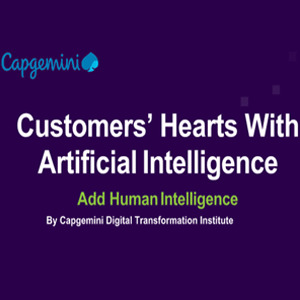 Mumbai, July 10, 2018–New research from Capgemini’s Digital Transformation Institute has revealed that artificial intelligence(AI)is no longer alien to consumers, with close to three-quarters(73%) indicating they have interacted via AI, and69% of those who have used AI being satisfied with those interactions. 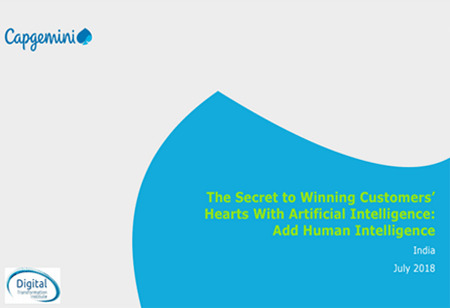 The report, “The Secret to Winning Customers’ Hearts with Artificial Intelligence: Add Human Intelligence” reveals that 55% of consumers prefer interactions enabled by a mix of AI and humans, and 64% want AI to be more human-like. These human-like qualities can generate significant goodwill and drive a greater propensity to spend for nearly half(48%)of consumers.However, many organizations are failing to take consumer pain points and preferences into account when applying AI technology to their customer experience(CX), focusing more on traditional metrics such as the cost of implementation and expected return on investment(ROI). The report, which surveyed 10,000 consumers and over 500companies across 10 countries, found that 63% of AI-aware consumers like AI because of its 24/7 availability and how it provides greater control over their interactions. Consumers are also opening up to the possibility of digital alter egos - 48% say the opportunity to be able to delegate tasks to an electronic personal assistant is exciting, with another 46% believing it will enhance their quality of life. increasing their reassurance in AI having human-like attributes. More than three in five consumers(62%) are comfortable with human-like intellect. Nearly half(49%)say they would have a higher affiliation to a company if their interactions enabled by AI were more human-like. Surprisingly, this preference transcends the generations. Across all age groups between 18 and 55+ years, consumers prefer interactions to be enabled by a mixture of human and AI. However, customers want their AI to be heard, and experienced,but not seen. 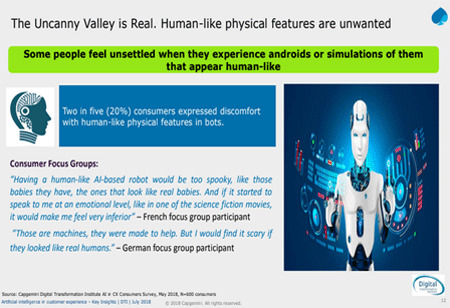 While they are keen for AI to have a human-like voice(62%)and the ability to understand human emotions(57%), physical features are deemed ‘creepy’. Over half(52%)of customers are not comfortable when AI is set up to look like a person. The report also finds that two-thirds of consumers(66%) would like to be made aware when companies are enabling interactions via AI. This research surveyed 10,000 consumers and over 500 executives at leading organizations across 10 global markets. All organizations had revenue above $1 billion in FY17. The global survey took place in May 2018 and was supplemented with three virtual focus group discussions with 8-10 consumers per focus group in USA, France,and Germany. The research also included interviews with several key industry stakeholders and academics.